Price: 10.99 FREE SHIPPING IN US! AUTOGRAPHED! 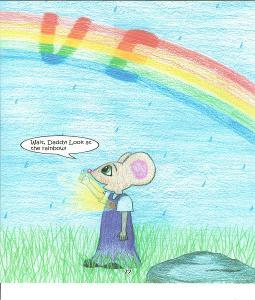 Annie Mouse wants to make Daddy proud of her by finding the pot of gold at the end of the rainbow. She gets lost while searching and is afraid Daddy will be upset with her. 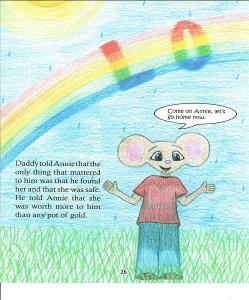 When Daddy finds her, he helps Annie understand that she is worth more than any pot of gold. Annie learns that the true pot of gold is love. A story for all ages. Inspired by the poem of the same name, by Charley Barker of Neosho, MO.